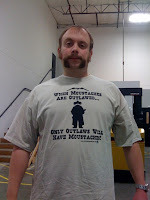 See in the past for Moustache March we have had shirts and said shirts were sometimes $12, sometimes even $15. But desperate times call for desperate measures. So I decided to make sure this year that didn’t lack in amazingness, but did lack in cost. Yeah that’s right, when is the last time you only had to pay $8 for a new and exciting tshirt? And better yet, when is the last time you could get a new, albeit last year’s design, shirt for only $6? So while we suffer through these tough times, I thought I would do a little something to let you splurge on a tight budget. So head on over to the MoustacheMarch.com official store and pick up a shirt or two and some other reasonably priced good stuff. Side note, when I was discussing this blog post with my wife she asked why this wasn’t a bailout plan for us…well to be honest I didn’t think that was the right thing to do…I mean I have made a habit of pooring too much money into Moustache March over the last several years and, if I know anything, now is not a time for change.